Ah, a hipster romance. How delightful. I know there are a lot of people who hate hipsters, with their skinny jeans, vests, pretty frocks and quirky habits. But I want to be hip enough to be a hipster. I just don’t have the commitment, but if I could move to Brooklyn seven years ago, there would have been no stopping me. Tom (Joseph Gordon-Levitt) is trained as an architect but working in a greeting card company. 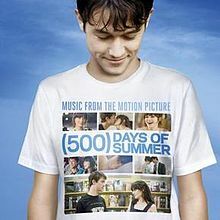 He believes in true love, and then along comes Summer (Zooey Deschanel). She doesn’t believe in love. They have a relationship. The story is fragmented and told through scenes scattered across the 500 days from their meeting. We have scenes after a fight, with his sassy younger sister counseling him through the break-up, to their first romantic visit to Ikea. I really liked the way the story was told, even with the kooky dance sequence. I’ve admitted to being a fan of both of the main actors (The New Girl, Looper, The Dark Knight Rises), so I guess it is hardly a surprise that I enjoyed this film. Plus, it has a fantastic soundtrack that I regularly listen to on longs drives. It’s not for everyone. If you hate hipsters, you’ll hate this film. Summer is one of the characters considered by many to be a manic pixie dream girl (I think she needs a quirky hobby or habit to truly fall into this category for me), so that may put people off.